Approximately 100 people made their voices heard last week at a special meeting regarding potential locations for Blyth’s new fire hall and public utilities building and it was clear the community supported neither of the presented options. 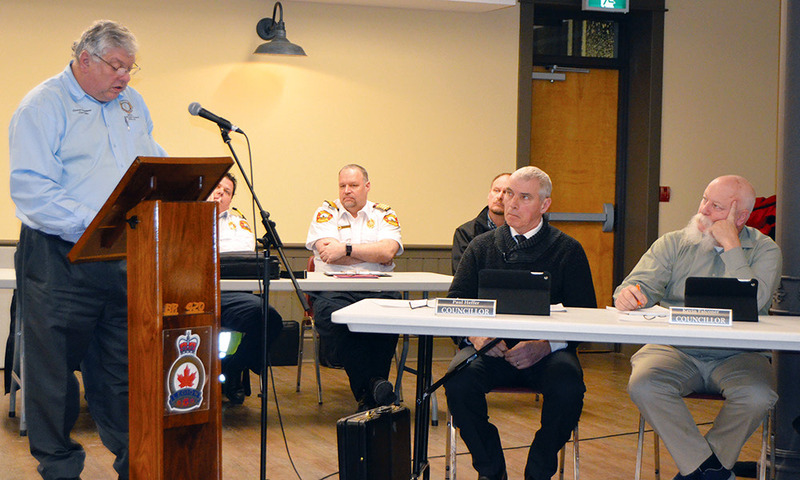 In mid-2018, the previous North Huron Council declared the Emergency Services Training Centre (ESTC), which included the Blyth fire hall, surplus. It was sold to Blyth Cowbell Brewing Company for $3.5 million, with the municipality planning on building a fire hall. Unfortunately for Blyth ratepayers, plans for a new fire hall couldn’t be completed as, shortly after the sale was approved, council was put into “lame duck” status, meaning they couldn’t approve major financial investments like a new hall or the purchase of land for it. The result is that the new council was sworn in with just under a year to find a home for the fire hall with a deadline to vacate the ESTC by Nov. 30, 2019. 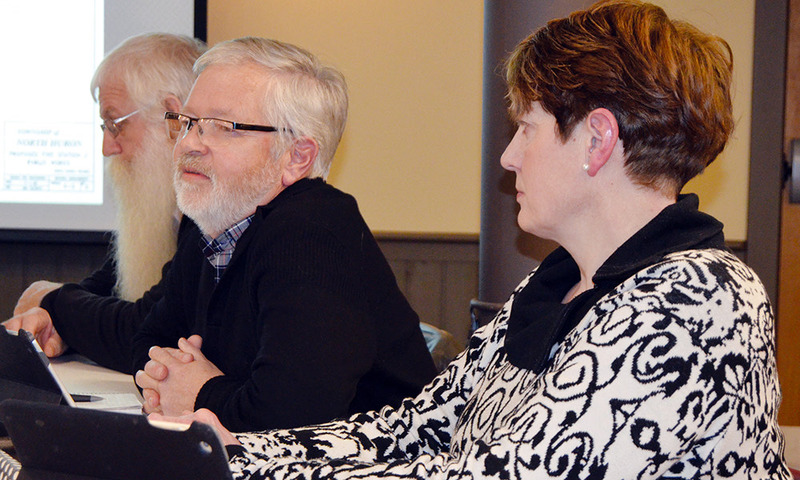 Following three months of closed session discussions, council held a special meeting on Jan. 31 at Blyth Memorial Hall to review the type of location council wanted to build and where it should be located. The meeting started with Director of Recreation and Facilities Sean McGhee explaining the decision process council had to go through to ultimately choose a site. With three options on the table, a fire hall, a fire hall and Blyth public works site and a fire hall and Blyth and East Wawanosh public work sites, council had to balance the needs of the municipality with the funding available, which is approximately $2.5 million. Consolidating the fire hall and Blyth public works department was universally agreed upon by council. While the East Wawanosh public works department had initially been considered, council decided that it was in good condition and had sufficient space for the future and wasn’t in immediate need of a new home. The most cost-effective option, building just a new fire hall, would result in the Blyth public works building, which is in “rough shape” according to staff, to continue to be used. The building is actually the former Fire Department of North Huron fire hall, but was abandoned by the fire department due to problems with space and accessibility. The consolidated Blyth public works shed and fire department site would require approximately 12,500 square feet, and McGhee said it would be a “complex facility”. The building is estimated to cost $1.9 million and would be constructed in phases, McGhee said, to make sure the apparatus bay is ready by the Nov. 30 deadline. McGhee then addressed where the facility would be built, saying that, after numerous meetings, two locations had been deemed feasible. He explained that several private sites presented in closed session had also been considered by council. “Due to that confidentiality, we’re not able to share details around the privately-owned properties,” he said. McGhee then outlined the parameters used, including community safety, accessibility, size, municipal servicing, cost to service, cost to purchase (if applicable) and keeping the site within North Huron boundaries. He broke down the benefits and challenges with private and municipally-owned land, before announcing the two sites: the Gypsy Lane site located where the Radford Memorial Baseball Diamond is at the Blyth Campground and the North Street site located beside the existing water treatment facility. At that point, Reeve Bernie Bailey turned the discussion to council to discuss both which build they wanted to pursue and where it should occur. Council quickly narrowed the three options for the building’s services down to one, saying it only made sense to go with a combined fire hall and Blyth public works building. East Wawanosh Councillor Chris Palmer said he was against amalgamating the three buildings from the beginning, due to logistics of operators for East Wawanosh having to drive to Blyth before being able to tackle work like clearing snow off the road. Beyond that, Palmer said, the shed and yard are sufficient, and have space for expansion. He said that was unlike the Blyth shed, which requires significant work. “Combining the Fire Department of North Huron [structure] and the public works shed makes all the sense in the world,” he said. Palmer also asked about limitations to the North Street location, prompting McGhee to say that water service would need to be extended by 200-250 feet to the site, and the road would need to be brought up to an urban profile, including gutters, curbs and paving. Fire Chief Marty Bedard also explained there were concerns about how far back from Blyth’s main street the North Street site would be, saying that on particularly snowy evenings, it could be inaccessible. When it came time to consider the location, council’s discussion focused on how North Street would be a more expensive option, as the Gypsy Lane location would be much closer to necessary infrastructure and the street, while not up to a complete urban profile standard, was sufficient for traffic. After that, Bailey urged council to proceed with making a decision, reminding them of the 10 month deadline. Deputy-Reeve Trevor Seip, however, wanted to get input from the community first. Brock Vodden, a former councillors who was part of the council that decided to sell the ESTC, was the first to address the issue. A long-time Blyth resident, he said that the Blyth Campground, where the Gypsy Lane site is located, is a heritage park site that was given to the community over 120 years ago to function as an agricultural park. Bob Watt agreed with the previous resident, Rick McInroy, saying that it seemed like council was trying to gloss over the challenges facing the Gypsy Lane location. and that a decision had already been made. He also said that the previous council putting such a tight timeline on the build was “putting the cart before the horse” and that the discussions the current council was having should have been held by the last council. He was also concerned that there could be substantial problems with the Gypsy Lane site due to the Blyth Lions Park across the street and the community events held at the Blyth Campground. Seip said he didn’t disagree with negative aspects of Gypsy Lane not being covered entirely, but said they had already been brought to council during previous meetings. He also said that some of the issues were fairly well known to both council and the community. He went on to say that he wants to hear public input and wants to know if there is another viable solution, if both the North Street and Gypsy Lane locations weren’t considered viable. Bedard also spoke to the safety issue, saying that the fire department is aware that there is traffic volume at the site. He said that the green lights firefighters use in their personal vehicles should announce their presence, while the sirens and lights of the fire trucks would be active whenever they leave the fire hall. Finally, Bailey said that the fire department had been involved in the decision-making process. He said that, having never been a firefighter himself, he went to the professionals and asked about these issues. Those conversations, Bailey said, included discussing safety of the sites. Peter Uyl, a North Street resident, approached the podium next, saying that he was speaking on behalf of the neighbourhood. Sandra Bos also spoke, asking what financial situation the sale of the ESTC had left the municipality was in. She said if construction of the building was within budget, it might be worth spending tax dollars to make sure safety was addressed. She also said that Gypsy Lane was not a stellar road as far as maintenance was concerned, and would “need a lot of attention”. She also drew attention to the fact that, sometimes, the green flashing lights aren’t enough. During a fire call on Halloween, Bos said she was out with her family and noticed that green flashing lights on firefighters’ vehicles just blended in with the Halloween decorations. She said that, for public safety, wherever the hall is built, a loud siren should be installed to let the community know firefighters were going to be responding. Bedard said that moving the fire hall wouldn’t eliminate traffic caused by firefighters responding to calls because most of the firefighters live or work in Blyth. Bedard also said that moving the fire hall outside of the community could reduce the response time for calls, which could have catastrophic results. Bedard then said that the clearest resolution to traffic issues is educating both the community and firefighters to be aware of one another. Seip answered Bos’ budgetary questions, saying that, after paying off the remaining debt on the ESTC, the municipality had $2.5 million to prepare the new site, run utilities and other infrastructure and erect the building. The municipality’s best estimates could result in $100,000 or $200,000 additional debt being taken on, meaning the municipality was eyeing a total of $2.6 to $2.7 million for the entire project. Sarah Cherrey, another Blyth resident, spoke next, saying that the green lights used by firefighters may be effective, but, in her experience, firefighters don’t always follow the rules of the road. Cherrey went on to say that the side streets that feed on to Gypsy Lane are poorly lit, and Gypsy Lane is home to a child with low vision who regularly walks her family’s dog at night. She said this would make a previously child-friendly area no longer safe. Cherrey sad she didn’t feel that either option was viable. “Spend the money on a private property instead,” she said. Katie Ansley, a Gypsy Lane resident, said she felt the suggestion of replacing the baseball diamond with a fire hall painted the council with an unfavourable brush. Ansley asked council if they planned on installing street lights and sidewalks on Gypsy Lane if the hall was going there and McGhee explained those changes were part of a long-term plan for the community. At that point, Bedard said he had taken offense to the suggestion that firefighters, either driving to the hall or driving fire trucks, would prove a hazard to pedestrians. Ansley said she wasn’t intending to paint the firefighters in a negative light, but that they would be put in an untenable position by having the fire hall in an area surrounded by community facilities. “You shouldn’t be in that position,” she said to Bedard. Joanne Hickey also spoke to the firefighters, saying that no one would ever insult them. She said she agrees that Gypsy Lane, before it could be considered, needs to be built up substantially and that the very topography of the road needs to be changed. She said that the cusps of two hills on the road would need to be shaved down, the road itself isn’t wide enough for emergency vehicles, and there aren’t sidewalks and lighting. “Trucks are large and hard to manipulate and coming out of there would be a nightmare,” she said.“It makes sense to find private land at the North end of Blyth. Bedard said that trucks entering or leaving the site shouldn’t be a problem, as any fire hall would have a large apron. As far as specific paths for the fire trucks to take, that would have to be determined with council. Hickey also said that she had heard the majority of calls were north of the community, citing a statistic of 70 per cent she heard at an all-candidates meeting, however Deputy Fire Chief Chad Kregar said he couldn’t confirm that was accurate and that he felt calls were likely closer to 50/50. Former Reeve Neil Vincent, who presided over council when the ESTC was sold, said he has been following this issue closely for a number of years. He said that Blyth Memorial Hall, where the meeting was being held, was completely renovated in eight months just a few years earlier, so building a new hall in 10 months could be done. Vincent called on council to acknowledge the significant concerns being raised by residents, before saying he agreed with amalgamating the two buildings into one. He said that building on the north edge of the community, over the two options presented, seemed beneficial and added that the right decision needed to be made for the village of Blyth. “The thing of it is, with firefighters getting to the fire hall, a location right off [County Road 4] at the north edge of the community is the best you will do in Blyth,” he said. “So what if you have to buy two or three acres. It’s going to be cheaper than redeveloping the road from North Street. Blyth resident Rick Elliott said he was concerned that costs of developing the proposed sites hadn’t been discussed beyond the cost of running water to the North Street site. He said North Huron hasn’t paved a municipal street in Blyth since amalgamation, and both North Street and Gypsy Lane need to be upgraded to make them viable solutions. He said that if a site costs $1.8 million to build, but $2 million to redevelop, the public doesn’t have that information. Elliott also pointed out that Central Huron Council would likely want to re-evaluate the fire coverage polygons if the fire hall moves north of the village, resulting in less funding coming from Central Huron for fire protection. Elliott, like others, then asked why the ESTC was considered surplus when another building wasn’t ready for the fire department to move into, a decision that falls on the shoulders of the previous council. Chris Lee also asked what council would do if the new fire hall wasn’t ready in time for the Nov. 30 deadline. McGhee said there were options being considered, including putting the fire trucks back in the former fire hall, the public works shed that council had previously described as being in need of replacement. Further to that, McGhee said that any discussion with a design engineer has emphasized the fact that the project needs to be phased so an apparatus bay is available for fire trucks before Nov. 30. Citizen Publisher Deb Sholdice told council that the Blyth Campground, Blyth Lions Park and the annual reunion of the Huron Pioneer Threshers and Hobby Association are consistently held up as the “crown jewels” of Blyth’s ability to generate tourism. She said it was troubling that council would consider diminishing the campground. Todd MacDonald spoke to the disparity between facilities in Wingham and Blyth, saying that the “Taj Mahal” building that is the ESTC was a mistake, but North Huron continues to pour money into similar projects in Wingham like the North Huron Wescast Community Complex. Sandra Bos once again spoke, saying that, council, by considering the Gypsy Lane option, was setting up the Fire Department of North Huron and its firefighters to be attacked. Bedard said that council presented the two options to the fire department, and, given those limitations, the fire department felt Gypsy Lane was the better space. “They asked for our opinions and we are giving them what they would like,” he said. After some comments from council members, Les Cook said he wanted to make sure council took away the right message from the meeting. He said that neither of the options presented were good, but council needed to know that the Gypsy Lane site was completely inappropriate for a fire hall. John Stewart, representing the Blyth Lions Club, said that while the club endorsed the fire hall being within or close to Blyth, there were concerns with the proposed locations. Stewart pointed out five concerns the club had with the Gypsy Lane location, saying that the Radford baseball diamond was constructed at considerable cost to the community. He said that, aside from the cost, there was substantial volunteer labour as well. He said that removing one of the two baseball diamonds would damage the community’s appeal to organizations looking to host baseball tournaments, which in turn will hurt community groups like the Lions, which benefit from those events. He said there have been discussions to secure additional baseball tournaments, and that losing the diamond would shut down those opportunities. Lions Park, which includes a playground that has been built and maintained by the Blyth Lions Club was the next concern Stewart raised. He also said it was “difficult to comprehend” how firefighters would access the site during events like the Huron Pioneer Thresher and Hobby Association reunion. Finally, he pointed out that the baseball diamond is a memorial site erected in memory of George and Lila Radford for the family’s dedication to youth and activity in the community. “I trust council will give consideration to [the provided] information,” he said. Ray Hallahan, an East Wawanosh resident and former member of council who, like Vodden and Vincent, was part of the council that decided to sell the ESTC, spoke next on behalf of the Huron Pioneer Thresher and Hobby Association, which uses the baseball diamond every year as part of its annual reunion. Hallahan explained that the club is currently in its 58th year, and has supported the development of the campground. “In the past, our club purchased and developed parcels of land to accommodate our ever-expanding show,” he said. Hallahan said the organization just renewed a five-year joint use agreement with North Huron for the use of the campground, an agreement that has existed since before North Huron had amalgamated. “Our main concern with the relocation of the fire hall and our public works facility to the campground is the loss of space we use for our exhibitors, exhibits, working displays, daily parade and campsites,” he said, adding the campsite rental is the main source of revenue for the association. He pointed to the fact that the association already uses off-site land for parking and some events, stressing the need for the space. He also said that other organizations, including the Fire Department of North Huron, benefit from the annual event through fundraising opportunities. “The loss of this space would cause severe hardship in continuing our show, which is attracting many young people who have taken positions on our board or acted as a committee chair,” he said. After significant public feedback, some members of council spoke to the issue. Councillor Kevin Falconer said that he wanted the audience to know that North Huron had exhausted many private land options, which several public members had suggested would be better options than those presented. Seip said that he was understanding of the concerns presented by the ratepayers, but buying and developing a piece of land could potentially cost more than using existing municipal land. Bailey reminded the ratepayers that, despite some people believing otherwise, a decision had not been made yet. He also said that, as far as private land goes, council can’t comment on negotiations with private citizens. The issue was set to be brought back to council on Feb. 4, at which time council, after a lengthy closed-to-the-public session, announced that it would be pursuing private property options in the coming weeks, though council could not be specific in regards to the properties being considered due to legal reasons.